Allied Health Scholarships for 2017 Academic Year. There will be a limited round of Allied Health scholarships for 2017 academic year, with funding covering a 12 month period only. SARRAH will open applications for scholarships for the following scholarship streams. Please visit respective scholarship pages for more information. 1. 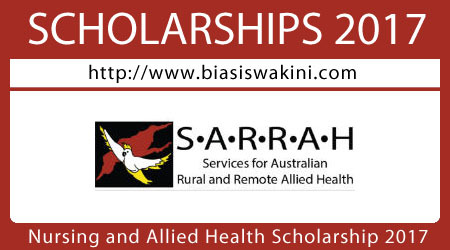 NAHSSS Allied Health Postgraduate Scholarship stream. 2. NAHSSS Allied Health Undergraduate (Entry-Level) scholarship Stream. 3. NAHSSS Allied Health Clinical Psychology Scholarship Stream. 4. NAHSSS Allied Health Continuing Professional Development Scholarship Stream. 5. NAHSSS Allied Health Clinical Placement Scholarship Stream. 0 Komentar untuk "Nursing and Allied Health Scholarship 2017"